KAI MALINA PROPERTIES-H719 7th Fl Ocean View Studio, New Bed/Carpet, 1st Class! This explanation may help since Honua Kai can be confusing. So Honua Kai is 628 individually owned condominiums that belong to a Homeowners Association. It's not a hotel. Every owner chooses to either use the onsite management which is now Outrigger or they choose an outside rental company (ORC). Outrigger is not the Resort they're just the onsite rental managment company. Now they own the front desk area and some other areas at Honua Kai, (meaning the HOA did not choose them and cannot remove them). All guests have access to the pools, restaurant, stores, Spa, fitness center and concierge. No Self-Parking/Resort/Occupancy Fee applies to 2019. 2020 is subject to change. 1) There will be a $5/day valet parking fee imposed by the HOA on all guests. 2) There will no longer be a phone in the unit. In looking at the phone bills guests just are not using it and now we're starting to get robocalls/solicitors coming in. BOOK HOKULANI 719 WITH CONFIDENCE. Aloha, my name is Joe Devane and my wife Rhonda and I are a licensed Real Estate Professionlas in the State of Hawaii (Joe RB-18850 Rhonda RS-26237). We are also the owner of Kai Malina Properties, LLC, RB-22032. I WAS THE HONUA KAI RESORT DEVELOPER'S REAL ESTATE BROKER AT HONUA KAI FROM 2009 to 2016 when the property was sold out! I am also a licensed attorney in both Hawaii (Bar No. 8295) and California (Bar No 178241)(voluntary inactive). We manage other units at Honua Kai, but we actually own this unit. Updated: 12/10/18- Here's an email we received from a couple who stayed with us for their Honeymoon. 'We wanted to write this sooner but have been very busy back in CA. We want to thank you very much for renting your place to us for the week. We had an amazing honeymoon and definitely brought back the “Aloha Spirit” (I notice it most when I’m driving in L.A.!). The place was spotless and all the little things you guys did made us feel instantly at home. The champagne and Maui coffee were greatly appreciated and enjoyed. We enjoyed the live music at Dukes and were happy to be able to walk to Whalers Village from Honua Kai. It was such a special trip for us and the condo was the icing on the cake. We see now why you guys moved to HI and we could see ourselves there one day too. We’ve already started talking about our next trip to HI! As we sort through our pictures and daily journal we get to relive all the magic that Maui had to offer. It may be hard to understand the difference in views and service while at your computer, but you will understand those differences when you get here. We only manage units at Honua Kai and since we only manage 10 units we are not too big. We do not have employees , so you will work and speak with us. We've have had the same cleaning gal (independent contractor) for 10 years and our kids went to school together. That relationship helps make our units the cleanest you will find at Honua Kai! 1) Check-in: We either greet you at your car upon your arrival at the Resort or we utilize the bellman check-in service. You will be told where things are located and escorted you to your room if you'd like. Parking will be explained. We see too many other guests that are left to fend for themselves, and we don't want that. 2) Service: We present each guest with a Welcome Aloha Package which includes a box of Hawaiian chocolates, a bag of coffee, AVEDA HAIR PRODUCTS and SOAPS and a bottle of chilled champagne. We also provide beach chairs and towels*, boogie boards, binoculars to watch the whales, free wi-fi internet and condiments and the cleanest room at the Resort. * All of our units are part of the HOA's beach/pool towel vending machine program, so you will have plenty of clean towels for the pool and beach. We are at the Resort all the time and live only 5 minutes up the street, so if anything should require our attention WE are quick to respond. 3) Location Please be careful here. All the rooms here are beautiful, but unfortunately for some they don't realize the importance of location until they arrive. Our unit looks over the palm trees not thru them and overlooks the koi pond, pool, and all of those tiki torches at night, very cool, very romantic. Our Studio is 595 sf and located in the inner courtyard. 4) Price: We offer the most competitive price. Some units may be a little less expensive, but you will not have the location or the view or the owner right there to handle any issues. -No worrying about when the maid service is going to interupt your day. -We personally supervise the cleaning of our unit for every check-in. -Charge all resort costs on your credit card. -We want you happy and we want you back! We will TRY accommodate early check-in or late check outs when the schedule allows. We understand that many flights arrive late morning and that many flights depart late at night. We were regulars on that red eye to San Francisco many, many years ago. 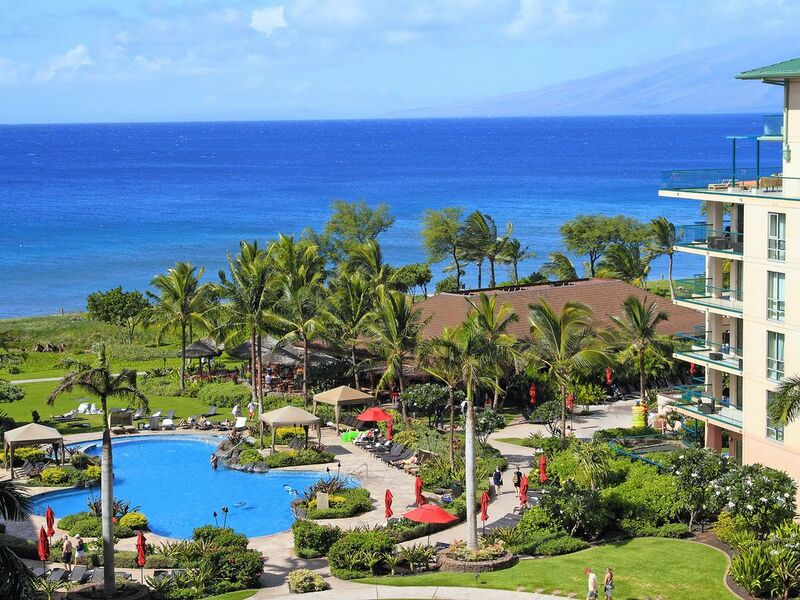 Brand New, Luxury Resort on Kaanapali Beach. This was the first whole ownership condominium on Kaanapali Beach in 30 years. We never planned on buying our vacation condo 4 minutes from our house, but this was too good to pass on. We do everything ourselves from this website to supervising the cleaning our room. Our goal is not 100% occupancy or to be the most booked studio at Honua Kai. We charge a rate that keeps our occupancy at a level that allows us to keep the suite looking great. We want Maui lovers and great guests staying with us who respect that we personally take care of things. Finally its a studio suite, so there is no low season or shoulder month since couples travel year round. Just kidding, it's Maui, who needs a heater. Bosch Condensation Dryer-Not vented so takes a long time to dry. All dryers at Honua Kai are like this, nothing we can do about it. Free WiFi in the unit. Everything was spot on. Great ocean view,great condo,great weather ok maybe VRBO had nothing to do with that but....everything was perfect. Thanks Joe for all your help. I had never heard of Honua Kai before booking the property with Joe through VRBO. Let me just tell you, the pictures and description don’t do it justice. My husband and I kept saying to each other throughout our stay how beautiful the grounds were, with all of the pools and rock formations surrounding the pools and the fountains and the gorgeous beach. Dukes is an awesome restaurant with a stunning view where we ate one breakfast and one dinner and thoroughly enjoyed our meals. Honua Kai is located right next to the Westin, in a very prime location close to Whaler‘s Village and only about 8 to 10 minutes from downtown Lahaina. Joe was very helpful and very responsive with any questions we had. The condo had everything we could’ve needed for our stay, even a beach bag which came in quite handy, a cooler and some snorkel gear. The condo is very nicely decorated and appointed with everything you may need to cook during your stay. The valet was very prompt in getting our car each time. All in all a wonderful stay and would love to come back to Honua Kai! We enjoyed Joe's condo and the view is stunning. Condo has everything you need to enjoy yourself and kitchen is equipped with everything you would need to make dinner in or grill something on the properties grill. I would recommend this condo, and would stay again on our next vacation to Maui! Clean and exactly how it was described. Great property. The unit was like new with everything you need inside. Beach chairs, cooler, snorkel gear. Fully stocked kitchen. Good ocean view. Joe checked in to see if everything was good. I will definately rent from him in the future. poor value for average food. on your own to save $$. All in all, it was a fun first time visit to Maui! I would recommend this unit especially for a couple with one or two small kids, singles, or a couple. Very well equipped kitchen, comfy bed, great view of the ocean! Perfect studio for two!